How do I turn off antialiasing in MATLAB R2014b? These images show the difference between two lines, one with GraphicsSmoothing set to on and one with GraphicsSmoothing set to off. If your graph contains mostly vertical or horizontal lines that appear uneven in thickness, use the AlignVertexCenters property to eliminate the uneven appearance. By default, this property is set to 'off'. To eliminate the uneven appearance, set the AlignVertexCenters property for the lines to 'on'. 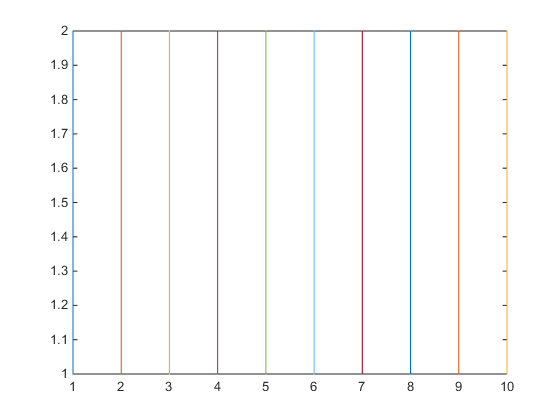 For example, create a plot of horizontal lines and set the AlignVertexCenters property for all of the lines to 'on';. Keep the GraphicsSmoothing property set to 'on' (the default).